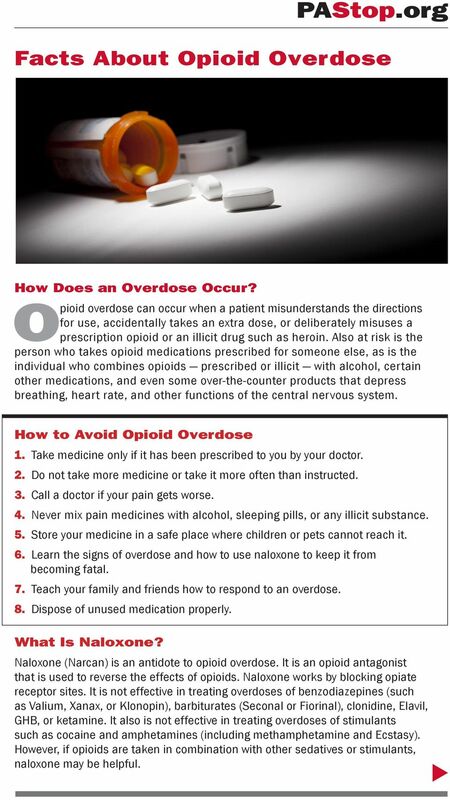 Download "Opioid overdose can occur when a patient misunderstands the directions"
1 Facts About Opioid Overdose How Does an Overdose Occur? 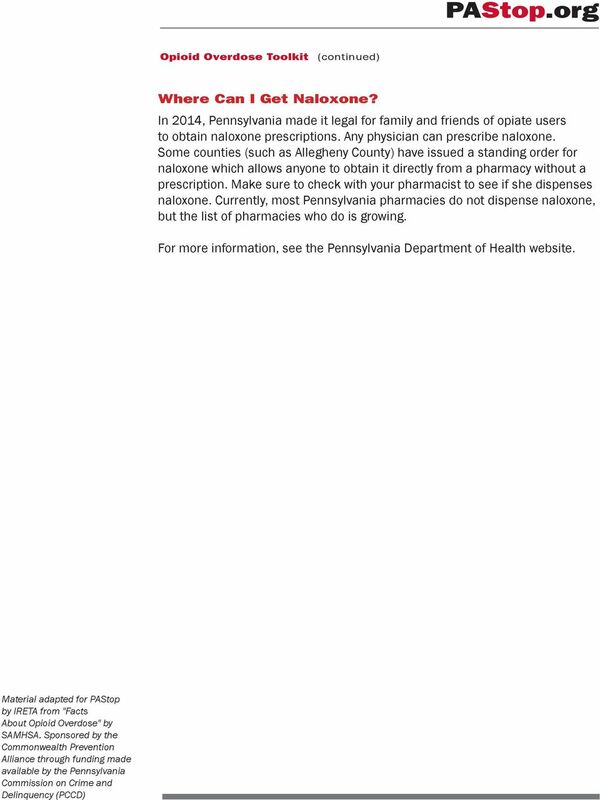 Opioid overdose can occur when a patient misunderstands the directions for use, accidentally takes an extra dose, or deliberately misuses a prescription opioid or an illicit drug such as heroin. Also at risk is the person who takes opioid medications prescribed for someone else, as is the individual who combines opioids prescribed or illicit with alcohol, certain other medications, and even some over-the-counter products that depress breathing, heart rate, and other functions of the central nervous system. How to Avoid Opioid Overdose 1. Take medicine only if it has been prescribed to you by your doctor. 2. Do not take more medicine or take it more often than instructed. 3. Call a doctor if your pain gets worse. 4. Never mix pain medicines with alcohol, sleeping pills, or any illicit substance. 5. Store your medicine in a safe place where children or pets cannot reach it. 6. Learn the signs of overdose and how to use naloxone to keep it from becoming fatal. 7. Teach your family and friends how to respond to an overdose. 8. 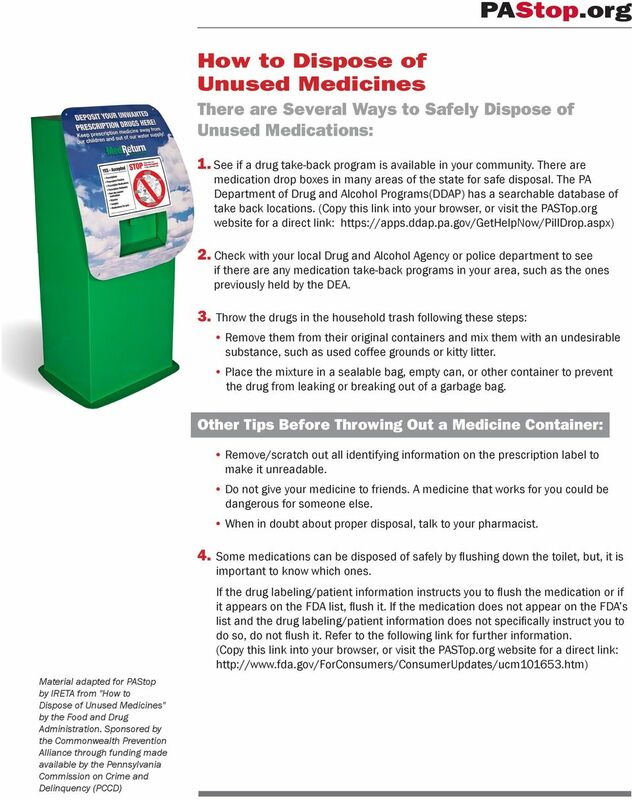 Dispose of unused medication properly. What Is Naloxone? Naloxone (Narcan) is an antidote to opioid overdose. It is an opioid antagonist that is used to reverse the effects of opioids. Naloxone works by blocking opiate receptor sites. It is not effective in treating overdoses of benzodiazepines (such as Valium, Xanax, or Klonopin), barbiturates (Seconal or Fiorinal), clonidine, Elavil, GHB, or ketamine. It also is not effective in treating overdoses of stimulants such as cocaine and amphetamines (including methamphetamine and Ecstasy). However, if opioids are taken in combination with other sedatives or stimulants, naloxone may be helpful. 3 Seeking Drug Abuse Treatment: Know What to Ask Trying to identify the right treatment programs for a loved one can be a difficult process. The National Institute on Drug Abuse (NIDA) recommends asking the following questions when searching for a treatment program: Does the program use treatments backed by scientific evidence? Effective drug abuse treatments can include behavioral therapy, medications, or, ideally, their combination. Examples of evidence-supported behavioral therapies are cognitive behavioral therapy, motivational incentives, and motivational interviewing. Medications are an important part of treatment for many patients, especially when combined with behavioral therapies. Does the program tailor treatment to the needs of each patient? No single treatment is right for everyone. The best treatment addresses a person s various needs, not just his or her drug use. For example, a patient may require other medical services, family therapy, parenting support, job training, and social and legal services. Because substance use disorders and other mental disorders often occur together, a person with one of these conditions should be assessed for the other. And when these problems co-occur, treatment should address both (or all conditions). 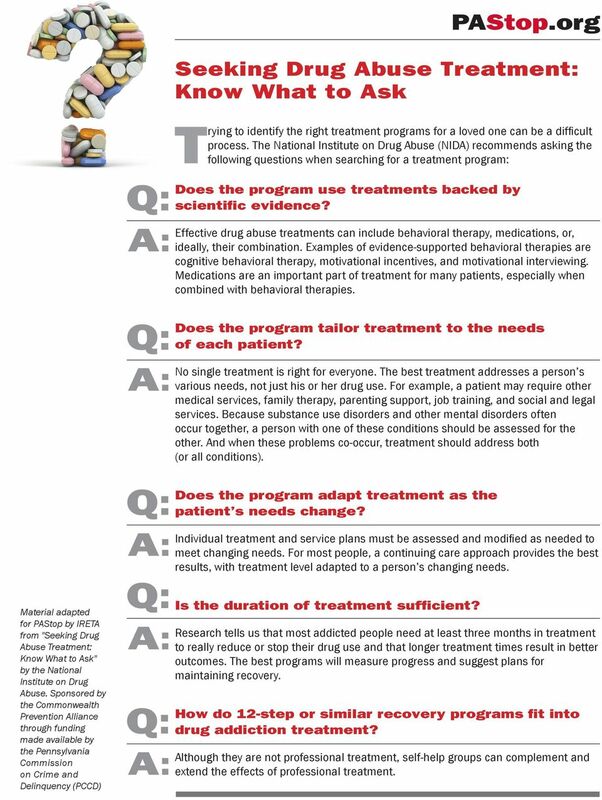 Material adapted for PAStop by IRETA from "Seeking Drug Abuse Treatment: Know What to Ask" by the National Institute on Drug Abuse. Sponsored by the Commonwealth Prevention Alliance through funding made available by the Pennsylvania Commission on Crime and Does the program adapt treatment as the patient s needs change? Individual treatment and service plans must be assessed and modified as needed to meet changing needs. For most people, a continuing care approach provides the best results, with treatment level adapted to a person s changing needs. Is the duration of treatment sufficient? Research tells us that most addicted people need at least three months in treatment to really reduce or stop their drug use and that longer treatment times result in better outcomes. The best programs will measure progress and suggest plans for maintaining recovery. How do 12-step or similar recovery programs fit into drug addiction treatment? Although they are not professional treatment, self-help groups can complement and extend the effects of professional treatment. 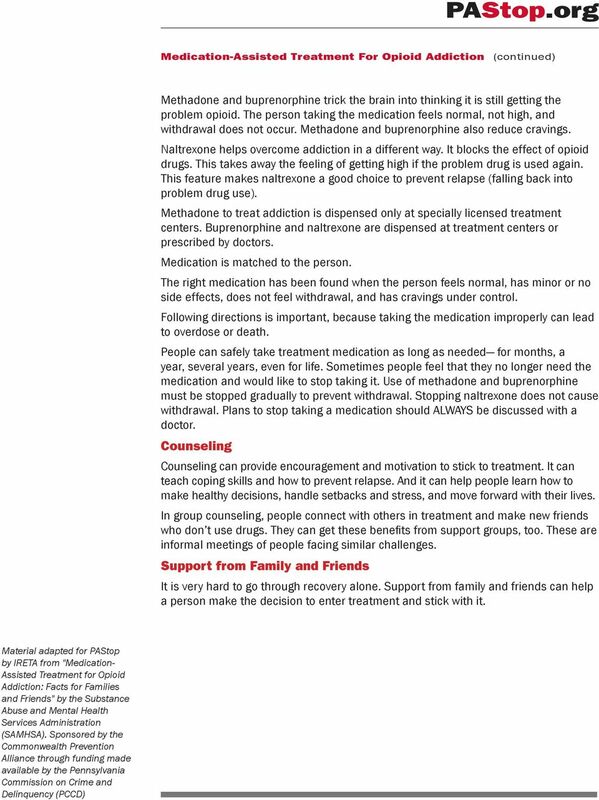 5 Medication-Assisted Treatment For Opioid Addiction Medication Counseling Support from Family & Friends Medication-assisted treatment is one way to help those with opioid addiction recover their lives. There are three equally important parts to this form of treatment: medication, counseling, and support from family and friends. These three parts work together to help people recover. 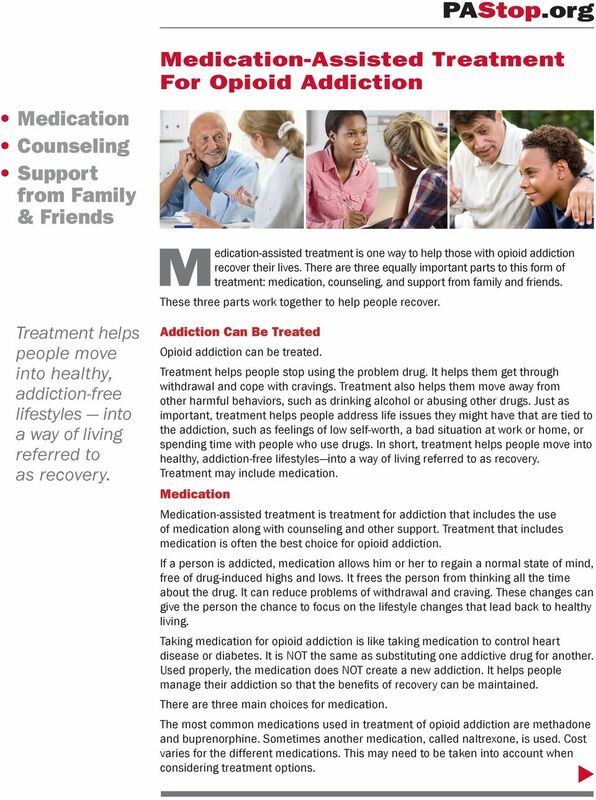 Treatment helps people move into healthy, addiction-free lifestyles into a way of living referred to as recovery. Addiction Can Be Treated Opioid addiction can be treated. Treatment helps people stop using the problem drug. It helps them get through withdrawal and cope with cravings. Treatment also helps them move away from other harmful behaviors, such as drinking alcohol or abusing other drugs. Just as important, treatment helps people address life issues they might have that are tied to the addiction, such as feelings of low self-worth, a bad situation at work or home, or spending time with people who use drugs. In short, treatment helps people move into healthy, addiction-free lifestyles into a way of living referred to as recovery. Treatment may include medication. Medication Medication-assisted treatment is treatment for addiction that includes the use of medication along with counseling and other support. Treatment that includes medication is often the best choice for opioid addiction. If a person is addicted, medication allows him or her to regain a normal state of mind, free of drug-induced highs and lows. It frees the person from thinking all the time about the drug. It can reduce problems of withdrawal and craving. These changes can give the person the chance to focus on the lifestyle changes that lead back to healthy living. Taking medication for opioid addiction is like taking medication to control heart disease or diabetes. It is NOT the same as substituting one addictive drug for another. Used properly, the medication does NOT create a new addiction. It helps people manage their addiction so that the benefits of recovery can be maintained. There are three main choices for medication. The most common medications used in treatment of opioid addiction are methadone and buprenorphine. Sometimes another medication, called naltrexone, is used. Cost varies for the different medications. This may need to be taken into account when considering treatment options. Science and Treatment Prescription Drug Addiction Treatment. Karen Miotto, M.D. David Geffen School of Medicine kmiotto@mednet.ucla. visited on Page 1 of 5 LEARN MORE (HTTP://WWW.NAMI.ORG/LEARN-MORE) FIND SUPPORT (HTTP://WWW.NAMI.ORG/FIND-SUPPORT) GET INVOLVED (HTTP://WWW.NAMI.ORG/GET-INVOLVED) DONATE (HTTPS://NAMI360.NAMI.ORG/EWEB/DYNAMICPAGE.ASPX?